That’s where Frase can help. Frase is a very useful tool to help content marketers streamline the process of researching and creating content. What caught my eye is the fact that this tool leverages AI, machine learning and NLP to do so. Automatically generates summaries of the content you’re researching. What Frase is trying to do is help you create better content, faster by allowing you to focus on the topics that matter to your audience. According to BrightEdge research, when asked about expectations for marketing technology providers to have native AI capabilities, more than 50% of surveyed marketers said it was important or a must-have. 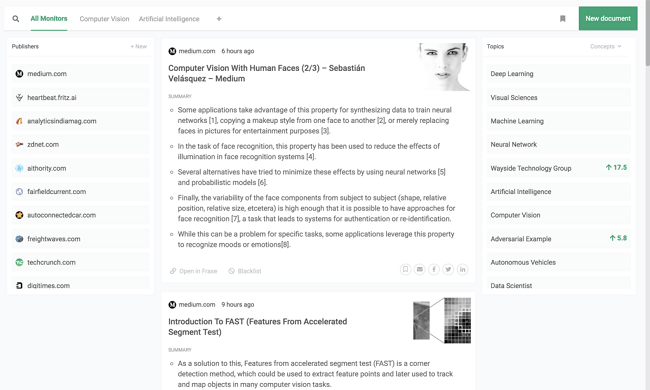 Frase uses Natural Language Processing (NLP) and machine learning techniques to understand and learn from the content in order to produce the most relevant content summaries. 81% of leading marketers agree that machine learning will be critical for personalized experiences along the customer journey. I know that this probably sounds like really complex stuff. The good news is you only need to focus on the output this tool produces for you! Basically, it sorts through search results based on the query you specified to identify the content that is most relevant to your research. This type of insight is incredibly helpful when doing content research, whether your goal is to create new content, optimize existing content, or curate content from the Web to share with your audience. When it comes to what Frase can actually do, they’ve done a great job making the functionality focused on your research goals. Right off the bat, you can choose whether you want to use the tool to create, curate, or optimize content or to create a content brief. Now, let’s take a quick look at the 4 key areas of the tool. 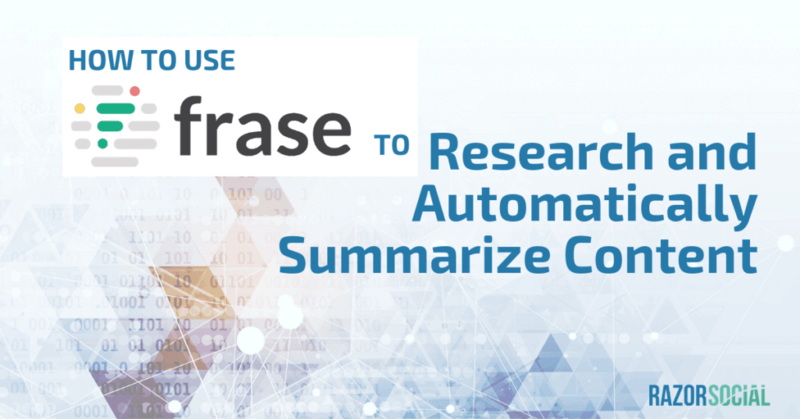 At the core of the Frase platform is a text editor with contextual topic research running in the background. You can write your content in Frase like you would with any word processor while having a lot of smart insights into your topic available right next to your document. Let’s say you wanted to write a piece of content about AI and marketing. As you can see, you can write your article and explore the most relevant search results for ‘AI in marketing’ on the right hand side of your document. No more switching between dozens of tabs for research! Content – Links to the best performing articles on your chosen topic. Topics – The topics mentioned in those articles with the number of times they’re mentioned. Under the Topics tab you’ll also see your content score and the target score achieved by the top articles for your keyword. Headlines – Here you’ll see the top headlines for your topic. Great for inspiration and understanding what kind of titles work in search. You want to write content that matches what people actually search for, right? Frase has a ‘Questions’ feature available so you can see what people are asking on popular Q&A sites, like Quora and Reddit. You can then try and answer some of those questions in your article! When you’re done writing your article, you can share the link with your coworkers, export into Word, PDF, or text document, or publish to your RSS feed. You think there’s more you could be doing with AI in your organization but don’t know where to start? Our team of marketing technologists can help. 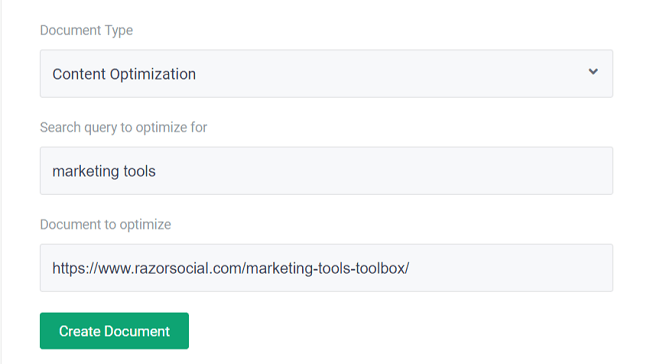 Now, this is probably the most interesting Frase functionality for content marketers. Because it’s no longer about who creates more content, but who creates the highest quality content and wins at organic search. Want to know your content score for specific keyword and how to improve it to rank higher? You can do that easily with Frase. Just select the Content Optimization document type and add the keyword you want to rank for and the URL of the article you want to optimize. If the content you want to optimize is not published yet, you can copy-paste it directly in the editor. Frase will process your content and analyze the top 20 search results for your target keyword to benchmark the topics mentioned in those articles against yours. You’ll get a content score that you can improve by adding in the topics mentioned in the top ranked articles for your keyword. The topics that your competitors mentioned in their content and you didn’t will be marked grey and these are the topics that you may want to explore further in your content. The cool thing is that when you click on a topic, Frase will first show you related topics and then also show where specifically that topic is mentioned in the search results. Once you’re done optimizing your content, you can go back to the ‘Topics’ tab to see if your content score has improved. Creating SEO briefs is really easy with Frase. The tool will look at the top search results for your target keywords and surface the topics you should cover in your content. To get started, choose Content Brief and enter the document name as well as the keyword you want to rank for. The later is important because the tool will use this keyword to surface the top 10 Google results for that keyword and provide you with the automated brief. The tool will also provide the list of relevant topics mentioned in the ten articles, the highlights for the topics, and the important statistics mentioned in the articles. And finally, you’ll get the summaries for the top ten search results. These automated content briefs are really helpful for speeding up your SEO research process! Plus, in addition to the content that’s created automatically, you can also add your own sections and comments to these briefs. If you share curated content, Frase can help you find and summarize quality content from the Web to share with your audience. You’ll start with creating a new document and selecting ‘Content Curation.’ When you type in your keyword, you’ll start seeing recent news about your topic in the editor. From there you can click on each article link to view the bulleted summary or click ‘Add to Document’ to automatically add an overview to your document in the editor. This is a great way to quickly create a weekly newsletter from curated content. You can easily add an introduction to the automated content summaries to personalize your newsletter for your audience. Finally, you can export your newsletter in different formats or push it to Mailchimp directly to send to your subscriber base. Improved content curation through AI should help marketers create better newsletters, incorporate more research on their original content, scale their social media posting, and create richer internal microsites. Tomas Ratia, Co-Founder and CEO at Frase. Frase makes it very easy to follow any topic on the Web and get a summarized feed of the latest content. Like most monitoring tools, it works by setting up the topics you want to follow. You can also apply conditions to topics such as ‘and’ or ‘or’ to get more specific results. 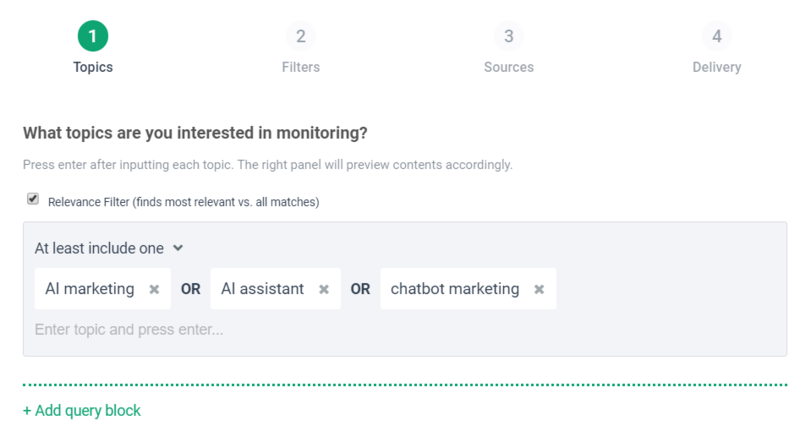 You can apply filters to get much more targeted articles and also set up your preferred sources to avoid getting too much noise from irrelevant publishers. Finally, you opt in to receive daily email with summarized sources and you can also share those digests with the people on your team. There is a free version, $25 per month version, $100 per month version and custom pricing for larger brands. Content marketers are always looking for ways to streamline the process of researching, writing, and optimizing content for search engines. It’s all about working smarter to produce the best possible results while minimizing time spent. Need help implementing the right AI tools at your organization? We’re here to help! With the constant advances in AI technologies, tools like Frase are surfacing to make us more efficient in things that, up until recently, relied completely on human intelligence. If you could cut hours in researching topics on Google and summarizing the top results to get insights for your own content, wouldn’t that be a smart move? So why not give Frase a try (there’s a free trial available!) and let me know what you think!